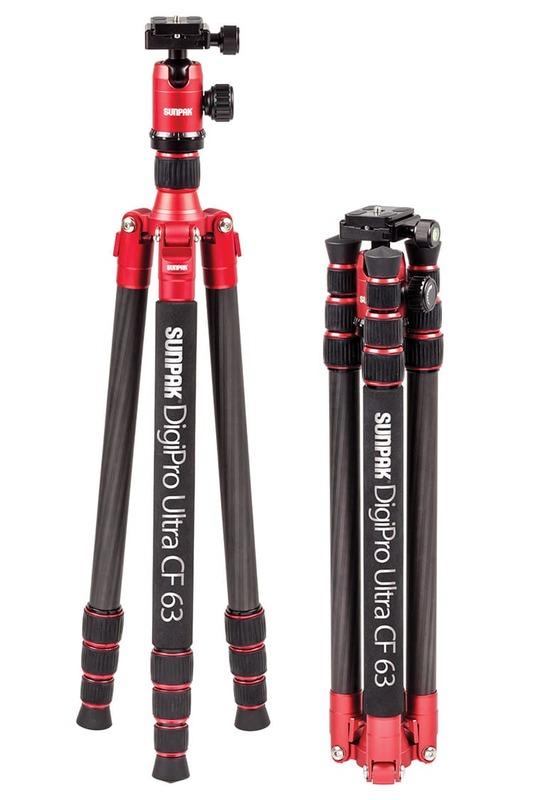 The DigiPro Ultra CF 63 is a reverse-folding tri-monopod that has carbon fiber tripod leg sections and a center column that becomes a full size monopod in seconds. The DigiPro Ultra CF 63 uses CNC machined components and extends to 63”, and folds down to 17.8”. Accented with red highlights on the head, chassis and leg locks to give it a unique look, the DigiPro Ultra CF 63 weighs only 2.94lbs and supports up to 34.8 lbs. 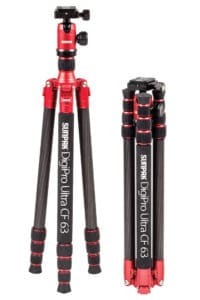 With its 4 carbon fiber leg sections and twist lock leg locks, the DigiPro Ultra CF 63 can set up quickly and easily. The non-marring rubber tipped feet allow for steady and secure placement. The leg angle adjustment latches let you set up the tripod at various angles – even low angle – or reverse fold.